Communities living along the Curbaradó and Jiguamiandó rivers in Colombia have been struggling for years to have their land returned. In 2009, more than ten thousand people in Germany took part in a postcard and email campaign to support these communities‘ claims for their rights. A decision by the Colombian Constitutional Court in May 2010 strengthened the communities‘ rights. But threats against them have again increased as people register for a local council election. One of the community’s spokespeople, Manuel Ruiz and his son were murdered in March 2012. In the communities’ struggle for their land – show them they are not alone! The restitution of the land: within close reach or still so far away? Between 1996 and 1997, more than 3.000 people from the Afro-Colombian communities of Curbaradó and Jiguamiandó were forced to leave their land because of violent actions by the military and illegal paramilitaries in the course of „Operation Genesis“. Since then palm oil and banana companies as well as large scale cattle farmers have been illegally occupying large areas of this land. 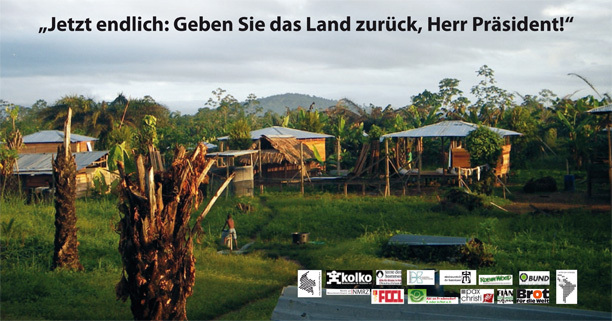 According to government information, they illegally took over 17.720 hectares of the communities collective land. In recent years, formerly displaced people have begun returning to their land. They have established ‘humanitarian zones’ as a protection mechanism in the midst of the ongoing armed conflict. A recent achievement is the confirmation of their collective land title rights by the authorities. The community has returned and begun farming part of the land; other parts cannot be used for traditional agriculture at the moment because of the palm plantations and the degradation of the land caused by these. Several palm oil companies are in the process of being taken to court. However, large areas of the land continue to be illegally occupied by companies and large-scale landowners. These companies are have brought in people from other regions to live and work fostering further social conflict. The Constitutional Court of Colombia strengthened the rights of the communities in May 2010 by ordering various measures to be taken to restore the communities‘ land. The Court decided that a registration process should be carried out to determine who lived in the riverine communities of Curbaradó and Jiguamiandó before the displacement and are therefore entitled to elect the new community council. This has been a controversial issue for many years. There are suspicions that settlers from other areas will seek registration in order to influence the elections; particularly since it is the companies that have brought the settlers into the area. Before the Constitutional Court’s decision in May 2010 the Ministry of the Interior had issued an official notice stating that they would “return” the land to a group of “community representatives” who were not recognised as community leaders by the people in the “humanitarian zones”. These so called “community representatives” announced that immediately on receipt of the land they would lease it back to the companies. Concerned about the rights of the community, the Constitutional Court stopped the “restitution” in May 2012, one day before it happened. According to the human rights organisation CODHES, there are 5.5 million internally displaced people in Colombia. With the passing of the law 1448 for victims and restitution of land in 2011, President Santos’ government prepared the ground for the restitution of land taken by violence. In 2010 and 2011, 26 people who reclaimed their land were murdered. There is a national protection programme for claimants but it does not offer them sufficient security. In May 2010, the Constitutional Court considered that the communities of Curbaradó and Jiguamiandó were at high risk. To enable communities to have their land returned, the court ordered a registration process of the community members to be carried out. This register would form the basis for the election of the Community Council. The court also ordered a protection plan to be established in cooperation with the communities. It wasn’t until the end of 2011, that the Colombian government finally presented a protection plan. However, in March 2012 the court declared that the plan was not being properly implemented. In May 2012 the Constitutional Court stated again that there were insufficient security guarantees for the election of the community council and that the protection plan put forward by the government was neither appropriate nor sufficient to guarantee the safety of the community members. With the registration process coming to an end and the Community Council elections coming closer, the security risk for the communities has noticeably increased. According to the human rights organisation – the Ecumenical Commission for Justice and Peace (Comisión Intereclesial de Jusitica y Paz – CIJP)- 45 community representatives are currently being threatened, among them community spokesperson Maria Ligia. In March 2012 Manuel Ruiz and his young son were murdered – presumably by paramilitaries. Ruiz was one of the community’s representatives liaising with government agencies during the registration process. He had reported the death threats against him to government officials and had asked for protective measures to be taken. In 2005 community spokesperson Orlando Valencia was disappeared, tortured and murdered under similar circumstances. From 2005 to 2010, four community members from Curbaradó alone were murdered. Since the beginning of the registration process, the communities have reported two cases of violent disappearance, two murders and two attempted murders, as well as an increasing presence of paramilitary forces. In February 2012 an international delegation of human rights organisations established that, against the declared wishes of the communities, coca was being cultivated on a large scale on their land. I am very worried about the rights to life, food and physical integrity of the communities of Jiguamiandó and Curbaradó. Their land is still being used amongst other things for the illegally cultivation of oil palms and coca, as well as, extensive cattle farming. The communities are being threatened, discredited and murdered. Whilst Victims Law 1448 is an important step forward, the Colombian government must also ensure the safety and security of the communities reclaiming their land. • to guarantee that the communities can use their land freely and safely and with government support.